Click on "Radix icon" on your desktop & following window will open. And then "System Login" window will appear. 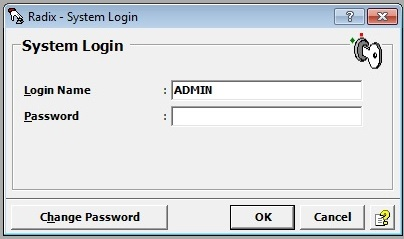 Enter "Login Name" & "Password" if you wish to set. Click "OK" & the system will navigate to the main window as shown below. It helps to you to open company from the existing one. Helps you to make new company. Helps you to delete company from the existing. Helps to carry forward the balance from one company to another. Helps you to change password. Helps you to take backup. Helps you to restore the backup. Helps you to import data from RELY. Helps you to do user settings. Helps you to exit from software. If the command bar is not enable user can enable it from User Preferences.